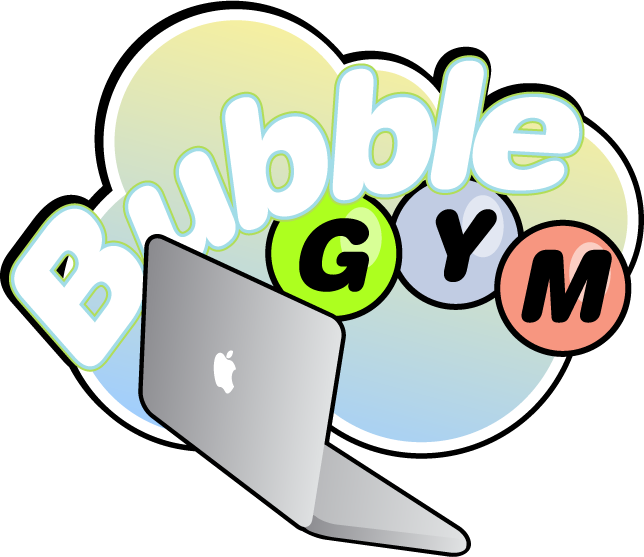 Bubblegym runs on all Apple Intel laptops. Reagular or "goofy" - Is your Motion Sensor mounted backwards? Bubblegym utilizes the SMS (Sudden Motion Sensoring) system built in to the latest Powerbooks. The SMS system is there to lift the reader from the hard drive's track if the computer was dropped or suddenly shifted. The actual sensor is a chip built into the logic board. Thanks to Amit Singh (see below) the values can be read and used for things like this. How the sensor chip works? I dunno... A little person inside or something? Bubblegym is shareware. Feel free to use try out the demo. If you liked the program please contribute $6. By contributing you support the shareware philosophy which is a good thing. In this partucular case the registration fee will be used as start for me to buy a Powerbook so more features can be tested. Unregistered, the app runs in demo mode. You will be able to move around and try out the amazing ability to control objects by tilting the Powerbook, but not be able to play the game. The registered version has no such limitations. To pay use the built-in payment function (preferred) or click here. You can distribute the latest available version of this application for non-commercial purposes as long as you include this ReadMe file. Please send an email to support(at)balooba.se if you have questions. Finally updated after almost 4 years! Updated default behavior for many new models. Modern computers have become so fast that the game became unplayable on them. This updates aims to fix that. Please send a feedback email if the game is too slow or fast on your machine or if the tilting feels backward. Please include which machine you've got. Universal binary. Updated default behavior for many new models. Most MacBooks and MacBook Pro laptops are "goofy"! Please send a feedback email if the tilting feels backward on your particular machine. Updated to support more hardware models. Bubblegym should now work on all Apple notebooks equipped with a sudden motion sensor. That includes the MacBook and the MacBook Pro. Recognizes various laptop hardware types and adjust accordingly. Still have not been tested on all so please report back if you have a newer Powerbook or iBook and think that the tilt-controls are backwards. Version 0.6.1 (released Dec 19) fixes an issue where certain 15" Powerbook G4 models got the tilting totally upside down and left-right mixed up. The application is now using an alternative method to probe the tilt angles. This means that the file Amstracker no longer is required. This is an experimental release (beta), please report how your specific powerbook or ibook model is working. New icon. It is now possible to select if your Powerbook is "regular" or "goofy". It appears that the tilt-sensor operates differently in some Powerbooks. The effect is that the ball rolling up when the users feel it should move down the screen. I would really like to know how many users that are affected by this. Please mail your computer's behavior and Powerbook screen size to me at orientation@balooba.se. Note: "Regular" behavior is when the ball rolls down the display when the computer is tilted to a point where the space bar is positioned lower than the F-keys. The goofy laptops do the opposite and also played an extra annoying background sound in versions earlier than 0.4. New graphics and music were added (see Acknowledgements below). The tilt-sensor driver must now be downloaded manually. Obtain the file amstracker.dmg from Kernelthread. Unpack, and install amstracker in the bubblegym folder. This is the very first release. No known issues or bugs but please let me know if you find any. Drag the folder with the application to anywhere you want. It must run from the hard drive, not from the disk image. For versions 0.4.0 and earlier, you must download the amstracker driver (double-click the link in the disk image) or obtain the file amstracker.dmg from Kernelthread. Unpack, and install amstracker in the bubblegym folder. To remove it, simply trash the application. It is optional to delete the small settings file stored at ~/Library/Preferences/bubblegym. When you read this there might be a newer version available. Check out http://www.balooba.se or Versiontracker at www.versiontracker.com/macosx. Report feedback, suggestions, comments etc to feedback(at)balooba.se. Versiontracker and Macupdate are other good places for discussing and learning about application details. There is curretnly too few questions to compile a list of the most frequent. Please ask something and you might get published here. The very first time the application runs it happens that the tilt sensor does not work properly. Please quit and restart the app. The app can take a while to start up. This is normal behavior. Future version might include a splash screen. The tilt directions might be completely backwards for you. This happened because we didn't knowprecisly how your machine behaves. Send us an email about your Mac info and we will update the app so it runs better on your Mac model. The application is self-explanatory. If there is a need (feedback please) I will make a manual or Help function. For those with older computers, please use the arrow keys. This does not really simulate tilting as it does not sense the leaning angle. To speed up the ball, press the command-key. The program was created in REALbasic. Thanks to Amit Singh at Kernelthread for the tilt-sensing engine, visit his site and take a look at his upcoming book. Thanks to Kristina Wallengren, David Remahl, Cecilia Johansson, Nir Netzer, Rebecca Braden, Felicita Hornung, Mats and Eva Berglund, see, and #macnytt for suggestions and betatesting. The artwork was done by Mattias Åsvik. The original soundtrack "BeeKei's Assault on Vivaldi" was composed and digitized by Branimir Krstic. Listen to samples from his brilliant classical version of the greatest rock album ever. Tilt functionality require a computer equipped with an Sudden Motion Sensor. As of Sep 2011 this includes all MacBook, MacBook Air and MacBook Pro computers, as well as the 12", 15", and 17" Powerbooks G4 released after March 2005. The application was created to run under Mac OS X and version 1.1 was tested only on Mac OS X 10.7.2. This little application has no known but presumably a number of unknown bugs. Please report any bugs, complaints, applause etc to the email address below. The program comes with no guarantees whatsoever but it beats me how anyone could use Bubblegym to cause any harm. I assume no responsibility whatsoever for any damage, data loss, hardware problems or any other undesired results caused by this or any other software or their usage. Bodily damage caused by dropping powerbooks on heads are not covered by the warranty. No pets were injured during the making of this game, but animals including but not limited to cats, fish tanks, babies, vases etc should at all times be kept at safe distance away from moving laptops. The user should backup his/her hard drive before using this application and by using the software the user and all the user's retatives agree not to press any legal charges on anyone affiliated with Bubblegym for any reason whatsoever including but not limited to anything. Parental guidance is recommended, do not swallow. It's a game created for entertainment only and the user agrees to be amused and smiling even during hard times caused by Bubblegym or by anything else, yes indeed! Balooba Software develops and distributes software applications for the Macintosh platform. The products range from games to system utilities. Balooba Software's goal is to make software that are recognized by (hopefully) beautiful design, simple and straight-forward interface, are easy to learn and use, and always price-worthy.